Certified Professional in Stormwater Quality Professionals are rigorously trained, tested and certified ensuring they are qualified to inspect: erosion and sediment control and stormwater compliance. All ECI certification programs require a High School Diploma or a GED (General Education Development) Credential. 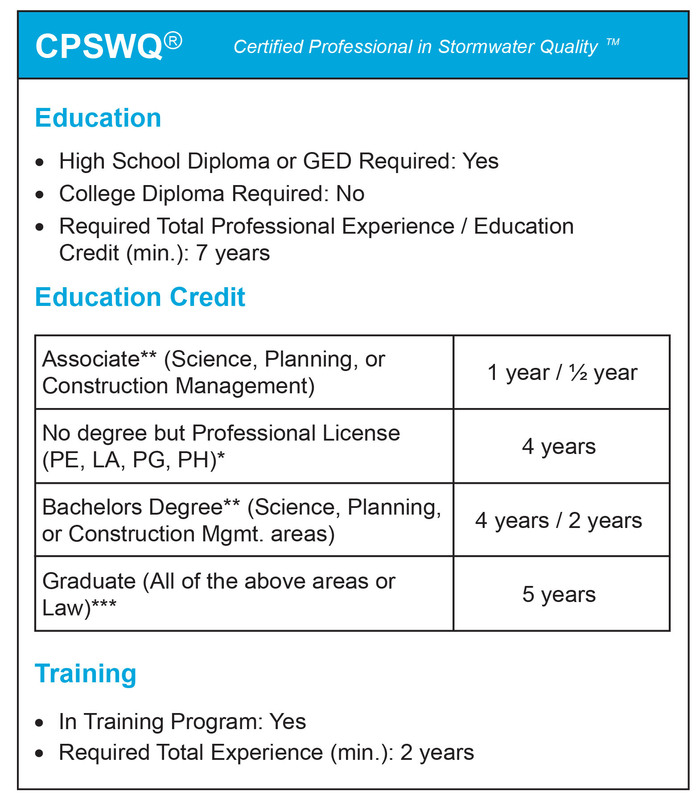 ECI automatically awards maximum Education Credit for Qualifying Degrees (science, planning, and construction management) as shown in the program-specific sections below. Transcripts are required. Education Credit is awarded for non-qualifying degrees at the rate of one half a Qualifying Degree. Transcripts or ECI approved documentation are required. Education credit may also be awarded for professional licensure without a degree. Verification of license is required. ECI reserves the right to review various state licensing not listed to determine applicability. Details about the In Training (IT) status can be found in the Understanding In-Training Certifications PDF. Anyone may take any EnviroCert review course at any time, review courses are not required in order to sit for an exam. Each review course is designed to ensure the applicants understand which concepts will be covered by the exam and act as a review for most of those concepts. Because this certification is meant to identify experienced professionals concepts will not be reviewed in detail during the review course. Applicants for the exam are expected to have a sufficient combination of education and experience to be able to independently study the materials identified in the General Principles Review Manual. Please visit our calendar of events to find the next course in your area. Note: students attending the Review Course must bring a General Principles Review Manual to the course. Exam applicants do receive a General Principles Review Manual when they apply to sit for an exam. If you have not applied to sit for an exam and you are attending a review course you will need to purchase a General Principles Review Manual. This can be done during the Review Course application process. Each course is designed to ensure the applicants understand which concepts will be covered by the exam and act as a review for most of those concepts. Because this certification is meant to identify experienced professionals all concepts will not be reviewed in detail during the review course. Applicants for the exam are expected to have a sufficient combination of education and experience to be able to independently study the materials identified in the General Principles Review Manual. The General Principles Review Manual also serves as the Review Course outline, you may download the CPSWQ – General Principals Review Manual -TOC to learn more. Only eligible candidates will be able to sit for an exam. Each candidate must complete the application process via the EnviroCert Certification Portal and pay the application fee of $300. The application fee is non-refundable and non-transferable. The list of requirements is quite extensive. In order to be fully prepared to apply please download the list of requirements (below) and gather all of the necessary materials prior to beginning the application process. Note: All initial application fees include a digital copy of the General Principles Review Manual. Using EnviroCert’s Certification Portal create an account and upload the requested information you gathered in Step 1. If you have previously created an account on the certification portal you do not need a new account for this certification, please use your existing log-in information. *Testing fees may vary if an Exam is sponsored or under other circumstances. Tests hosted by EnviroCert International have a standard $150 fee. Registration forms for all Exams will state the actual price for that Exam. Renewals must be done annually via the ECI Certification Portal. CPSWQ current renewal cost is $140. Renewals must be done by the date shown on the certificants’ wallet card, late renewals are subject to a $40 late fee. When using a debit or credit card a $6 third party credit card fee will apply. Registrants are responsible to participate in activities within their annual renewal period that satisfy the requirements for each certification they hold. CPSWQ Certificants are required to complete 8 PDHs during their certification year. CPSWQ-IT are required to complete 4 PDHs each year. PDHs may be recorded in a log but must ultimately be added to each registrant’s profile in the EnviroCert Certification Portal. PDHs are required for successful renewal. Please review the Professional Development Policy for detailed explanation of qualifying courses. Each year a minimum of 1% of Certificants’ PDH records are audited by EnviroCert. Looking for a CPSWQ for your team?